If you like all the things that are great about sports. 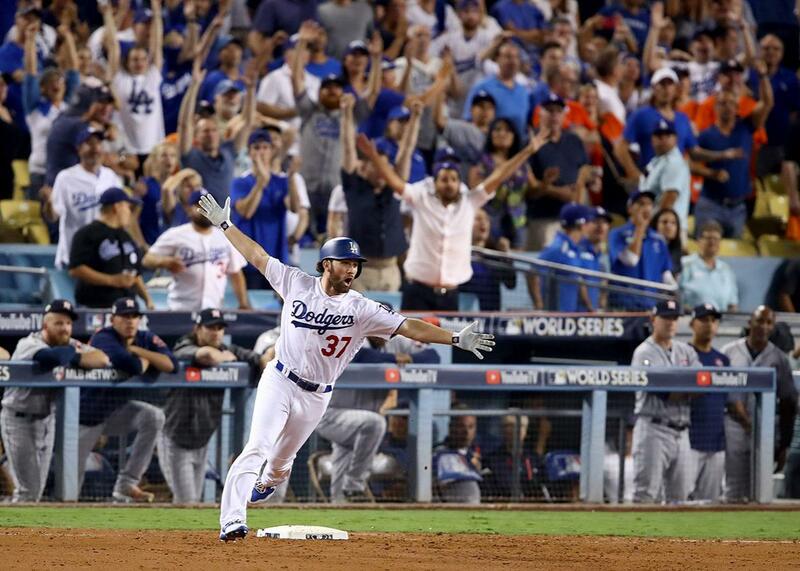 The Dodgers’ Charlie Culberson runs the bases after hitting a solo home run in the 11th inning against the Houston Astros in Game 2 of the World Series on Wednesday in L.A.
It’s late October, the only time of year when all big four pro sports leagues are in session. Basketball and hockey have just begun; football, you might charitably say, is getting interesting. I wouldn’t know; I’m watching the World Series. If you’re a fan of physical feats, outsize characters, and the sweet pull of a great narrative—that is to say, if you are a sports fan—you should be watching too. This year’s World Series matchup seemed likely to produce the best Fall Classic in a half-century. Wednesday night’s game, a record-setting home run derby that featured three dramatic, do-or-die comebacks—two successful, one not—proved it has. Wednesday night’s game had it all: moving pregame ritual, an intense pitchers’ duel, an extra-innings slugfest. The fans at Dodgers Stadium went bonkers a solid dozen times, then had their hearts broken. It was the most riveting 4½ hours of sports you’ll ever see. But if you didn’t see it, that’s OK, too. With the best-of-seven series knotted at one, it’s just the time for you to start watching. I know what you’re thinking: Baseball is slow. Actually, Game 1 was a taut two hours and 28 minutes, significantly shorter than this week’s Patriots-Falcons Sunday Night Football drubbing. Or you might be thinking: Baseball is boring. Game 2 featured seven lead changes and eight home runs, a World Series record. And it was played with style. “We’ll play with a lot of swagger, and let them know we’re here,” said Astros shortstop Carlos Correa. The announcers said he flipped his bat 30 feet in the air after hitting an 10th-inning home run Wednesday night. You may also be thinking: Who the hell are these guys? The Dodgers have Yasiel Puig, the most exciting player in the game to watch, a boisterous Cuban slugger who dances in the batter’s box. Clayton Kershaw is one of the few pitchers whose curveball can make your knees buckle from the couch. Their Game 1 hero was the 32-year-old journeyman-turned-star Justin Turner, who looks like a Wildling and has 14 RBIs in the playoffs. For the first time in franchise history, the Dodgers had six players hit more than 20 home runs this season. You can’t sleep on this team in a tight game. And the Astros? No baseball player is better or shorter than their star, the 5-foot-6 José Altuve. He’s a walking reminder that baseball is the only major sport that people with non-superhero bodies can not only play, but excel at. The ’Stros get more hits and have fewer strikeouts that any team in baseball, which means more action and less standing around. Only one team hit more home runs. There’s even a Hollywood angle: Their ace, one of the best players of his generation to have never won a World Series, is getting married to Kate Upton. You may also be thinking: Who cares? Well, the Astros have been around since 1962 and had never even won a World Series game until Wednesday night. They are the toast of Houston, the country’s fourth-biggest city, still reeling from the devastation of Hurricane Harvey. Correa, their All-Star shortstop, has been raising money and awareness for his native Puerto Rico. They are scrappy underdogs against the Dodgers, who once again have baseball’s biggest payroll—and it’s not even close. But L.A. is trying to escape its own ghosts. This is the first time the squad has appeared in the World Series since 1988, despite five straight division titles. The Dodgers play in the country’s second-largest city. Finally, if you’re really a stickler, you may have noticed that baseball’s (blessedly) tight playoff format—and the tippy nature of the game itself—tends to reward streaky teams. That means that merely decent teams on a tear often upend all-time great clubs in the playoffs, leading to poorly matched World Series. Well, not this time: This is the first World Series since 1970 to see two 100-win teams face off—six months’ worth of stellar play that’s carried through October. Could Slate have told you this on Tuesday, before the first game began under a sweltering blue sky in Chavez Ravine? Yes, but we wouldn’t have had the evidence to back it up. Now we do, in two games that were as engrossing as they were different. The first: a tightly played pitchers’ duel the Dodgers won 3­–1. (No sport makes art of the low-scoring game like this one—don’t tell me you like seeing field goals.) The second: Wednesday’s 11-inning thriller that sportswriters were calling the best World Series game in years. And it’s not over. It’s only just beginning. Game 3 is Friday night, and it’s not too late to get on board.